Tom Corbett and Dr. Joan Dale dolls 7 1/2"
A & H Doll Manufacturing, Inc. of New York City, is probably best known for their small 7 1/2 to 12" tall, hard plastic dolls from 1948 to early 1960s. 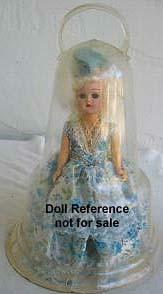 In 1953 hard plastic dolls were considered rather expensive to produce, a 12" tall doll was originally $8.95. A & H dolls, which are now usually very reasonable (except the space cadets shown on left), to add to a collection and the small size means you'll have plenty of room to collect them all. 1953-1954 A & H Marcie dolls, The Doll of Destiny, 12" tall, all hard plastic, head turning walkers, mohair wig, sleep eyes with molded lashes, jointed at the neck, shoulders and hips, have oil cloth shoes with ties, socks, removable detailed historical costume, usually with attached slip, petticoat, pantaloons and hat. 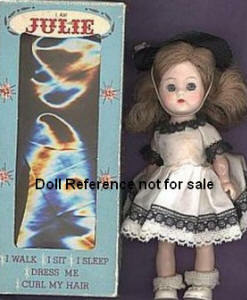 Doll is similar to a Dress Me doll, but better quality with removable clothing. Dolls are marked Pat's Pend. 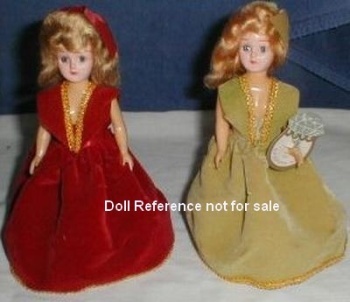 or Pat's Pending on back, clothing or box has Doll of Destiny and dolls name, these are the first known hard plastic dolls that were dressed in authentic historical costumes. Priscilla Alden, Marie Antoinette, Empress Eugenie, Empress Josephine, Elizabeth Woodville Grey, Mary Todd Lincoln, Molly Pitcher, Queen Elizabeth I, Queen Isabella, Queen Victoria, Betsy Ross and Martha Washington. 7 1/2 - 8" tall, all hard plastic, head turning walker, Ginny look a like, sleep eyes, dressed in a pink organdy dress, bonnet, purse, shoes and socks, fashions available separately, Gigi dolls are unmarked. 8" Gigi's Lil Sister baby doll mark, has molded hair & nursing mouth. 9" tall, all hard plastic, head turning walker, sleep eyes, wigged, fashions available separately, similar to her smaller sized buddy the Gigi doll shown at left. 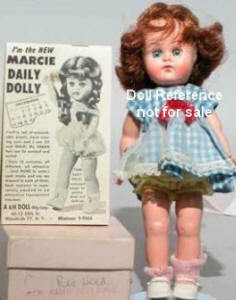 Marcie Daily Dolly is unmarked. I walk, I sit, I sleep, dress me, curl my hair Julie's box reads. She's 8" tall, all hard plastic jointed walker body, sleep eyes, glued on wig, came with separate fashions that fit other 8" tall walking dolls. Gripper snaps have "Rau Sklits" on them. 1961+ A & H Marcie Dolls, 9" tall, the Ad reads: Prize Package Dolls . 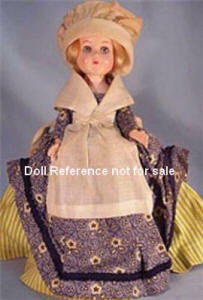 . . are yours with A & H Doll's complete series of beautifully costumed dolls . . . Belles in Bells, Teens in Bells, Gigi in Bells, Lil Sister in Bells. *Winner of 1961 Silver Award for original bell packaging. Dolls are jointed at the neck and shoulders only with stationary straight legs, molded painted shoes, sleep eyes, painted lower lashes, mohair glued on wig. These are basically a Dress Me Doll, on the bottom of the bell is the company name, A & H and A Marcie doll on it. 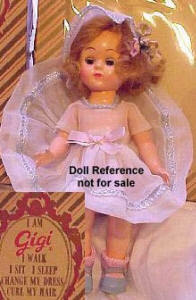 Some dolls are marked A Marcie Doll or This is a Marcie Doll on back or unmarked. ca. 1960s A & H Marcie Birthstone Belle Dolls, 9" tall, just like the above Marcie Belles dolls, but each doll was named after a month and the associated birthstone ie. January - Garnet, February - Amethyst and so on, each dressed accordingly. ca. 1960s A & H 1893 Telephone Pioneers of America Belle Doll, 15" tall, advertising commemorative doll for their 1960s? anniversary, plastic jointed body with vinyl head, rooted hair, sleep eyes, dressed in high collar long sleeve white blouse, long brown skirt, belt and shoes.